The purging of all unneeded things continues in our house as we prepare to put our house on the market. Saturday was shredding day for me and garage cleaning day for my husband. At least I had air conditioning. We did take 5 file boxes to a professional shredding company, but I thought I could handle the two garbage bags full of papers that somehow got overlooked. I was surprised to see our income tax returns FROM 1971. Yes. It was important to save those pieces of paper for 31 years. I came across other things, though. Interesting reminders. For example I saw a perspective on the economy. In 1985, we paid $200 more for our mortgage than we do now. That was two houses ago! And we haven't downsized. Interest rates in the '80s were quite high. I discovered that though I thought my washing machine was about 12 years old when I traded it in for an HE model in 2010. Actually, it was 17 years old. Got my money's worth out of that sucker! Reminders of all my pets who have died brought a few tears to my eyes. My three Shelties, the Bichon that was supposed to belong to my daughter (but who was my dog in the end), the kitties, the hamsters, the birds and all the litters of puppies we had. 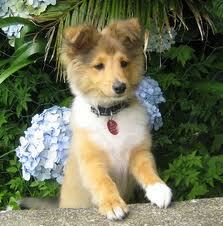 One of the Shelties I'd sold to a man in nearby town actually saved his family from a fire. I found out when he returned to buy another puppy the following year. Shelties sure are smart! My trip down memory lane would have been fine if I'd remembered how monotonous shredding is. The memories were good for the most part, but I am glad it's done. Now we have plenty of packing material. Unfortunately, I let mine pile up and when I had to move suddenly (from a 3 bedroom house with garage and a lot of storage to a 2 bedroom apartment with no storage), it all went into a storage shed. It is now all back here in my new house and needs to be dealt with (boxes, and boxes, and boxes of the stuff). I wish I could just take it all to be shredded without going through 25 years of junk, but unfortunately I didn't break it down when I boxed it up and there are important papers in with old junk (and, yes, tax records from the mid 70's). I am hoping to tackle it this winter, when being inside is preferable. But I will definitely be taking it to be shredded. Waaay too much to do myself. Lol I am very bad at keeping papers. Nowadays everything is electronic available, so I toss it all away. Good luck with the rest of the cleaning. I do both actually. Any mail or pay stub I shred now. But I am also purging. I dont have things quite so old as I dont have much storage space but i did just shred tax stuff from 2000. My purging is associated with my self journey in letting go. In unburying my true self. As the wall of flesh is taken down, I find that all the "stuff" I thought was so necessary to keep is another form of "hiding". It is so freeing to just let go. Glad I am not alone, Lynda! Lori, what a great way to look at this process. I do feel more free--mostly because I have a list and checked off one bag of "shreddables." And Aurian it is good about electronic storage. I just wish my bank kept electronic records longer than a year, but they don't. I shred as I go. 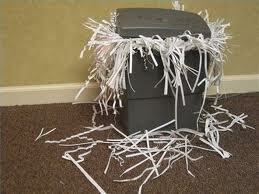 Right now I have a small pile and when it becomes an eyesore, I start shredding. I shred about once a week, particulary those pre-approved credit card apps, or the checks they like to send along with your statements. I also make a habit of purging the file cabinet every January and getting rid of what I don't need. That being said, I was surprised last week when I found a file I had somehow overlooked that had about 8 years of tax stuff I no longer needed. I will follow your example from now on, Heather. What paper nightmare we created! I am not a good purger!. I am NOT a Hoarder, but most definitely a saver. I am trying to be better, but it is difficult for me. I have check copies from 1995!!!! Yikes.....and yes I own a shredder! That's a lot of thinking for some shredding of newspapers. I had fun going along with you down the memory lane, and with all the mentions about pets and such. You have such a fun life. Ah, Millie. Newspapers would have been tossed. But it sure did make me think about all the memories stored in this overcrowded brain! I hate to shred, although I will if I need to rid myself of something with personal info AND I'm standing beside the shredder. Otherwise, I keep a Whole Foods paper bag in my kitchen, where the mail gets opened. I pop the offending material into that, and twice a year I haul it to a free local shredding event. I usually add a box or two of my mom's old records I've gone through in the previous six months (found War Bonds tucked inside her 1981 bank statement). That way, I don't feel pressured to go through everything at once, and yet I'm still making room in garage or closet. I even bought a nice fabric bin and had it embroidered with "Shred Me!" Gotta take your fun where you can.